My plan is to buy some MU shares and sell both puts and calls on the name. I don't know how closely some of you follow me. 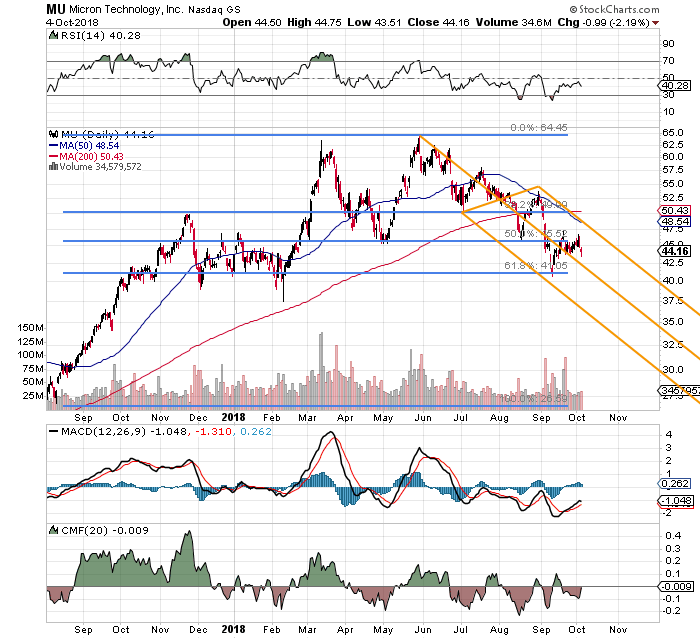 If you avidly read what I write, then you know that I have generally been a supporter of Micron Technology (MU - Get Report) for some time. Last week, I sold my equity stake. Not because I really wanted to, but when one plays the game in the way I do, one exposes him or herself to the risks of both having shares called away, and having shares put to you. Well, I was called away. Thanks to all of the premiums collected over many months, I actually took a profit in the name. I still want to be long, though. This is something that I think a lot of retail traders miss out on. We call it taking scalps in the business. Yes, there are times that this creates danger. For instance, late yesterday when the market turned, suddenly options premiums on the put side seemed overvalued to my naked eye -- and I acted, and before the algos could take the prize away. So, I come into Friday expiration short out-of-the-money Amazon (AMZN - Get Report) puts that expire today. Risky, yes. Might also be considered easy money if they don't crush that name today. If they do, well, I have to be prepared to pony up for the equity, but at least it will be at a discounted price that I have chosen, and been paid to accept this risk at my price. Gang, you would not believe how much one can whittle down a net basis price on an equity position through the sale of related options. And for those new to options trading, selling a call against a long equity position of correlated size does nothing to increase risk to principal. First off, I am already short $44 MU puts that expire tonight, so if Micron has a lousy day, I don't need to act in order to start rebuilding my equity stake. So, let's take a look at this stock. Obviously tech was under pressure, yesterday. Obviously the semiconductors have been under more pressure than the rest of tech for some time. Maybe not so obvious are the facts that MU is less exposed to weakness in NAND pricing than, say, their competitor at Western Digital (WDC - Get Report) might be. MU is really more exposed to DRAM pricing, which is preferable at this time. Traders should not take heart in the fact that the name trades at just 4x next year's projected earnings. That and $2.75 will get you a ride on a New York City bus. What traders should take heart in, is the fact that the firm is buying back $10 billion worth of these shares. CEO Sanjay Mehrotra has put the firm in the foxhole next to you. Artificial scarcity you say. Hypocrite you call me? Understanding the environment, I say. --Initiate with a purchase of a 10% to 12% stake at, or close to, the last sale ($44.16). --Prepare to add another 10% to 12% on any approach to the 61.8% retracement level that had already been successfully defended in early September. --Sell (write) a correlated amount (100 shares of equity exposure equals one options contract) of both $37 MU December 21 puts (last: $0.94), and $52.50 MU December 21 calls (last: $1.03). Assuming an entry level position of 100 shares, and the sale of one contract on each side, the trader will lower initial net basis cost from $44.16 to $42.19. Micron reports on December 17. The risks are that either profit will be capped by being called away at $52.50 by then, or that the trader will be opening him or herself up to having to average down at $37. Both outcomes I find attractive. If the shares stay between $37 and $52.50, the options expire, and the trader is free to play this game all over again, further reducing net basis. See how that works, gang? At the time of publication, Stephen Guilfoyle was long AMZN equity, Short AMZN and MU puts.